"The aim of music is not to express feelings but to express music. It is not a vessel into which the composer distills his soul drop by drop, but a labyrinth with no beginning and no end, full of new paths to discover, where mystery remains eternal"
Curiose queste tue foto Pietro, dove i rami di quest'albero esprimono tutta la sua grandiosità. Un abbraccio Pietro e buon week-end! A strange and mysterious tree. 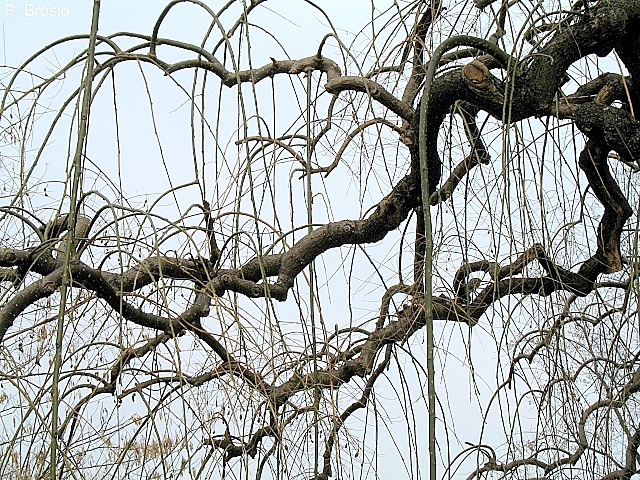 Those smaller supple branches look like they could be plaited. Nice how you tie it in to the music quotation. Pietro: Beautiful photos of the tree, music can sooth the soul. Ciao Pietro, what terrific photos of such an interesting tree!! Love the connection you've made with the music quote! Lovely words! Hope your weekend is going well! I love this beautifully designed Winter shot Pietro. These gnarly branches are so cool! Ragnatela di rami o labirinto...forse creazione di un albero capovolto? Immagini suggestive Pietro, complimenti. Buona Domenica anche a te Pietro! I love the quote. Art is art, not therapy. These branches flow like a waterfall, Pietro. So much life in this space. Beautiful association and photographs wastelands! Music can limit the feelings, but it does not limit the thoughts, these fly, as well as the branches of a tree always tend to reach the sky. Exquisite! My very first time to see such a beautiful young woman in wonderful knitted dress on gray, oh so cool! Buongiorno Pietro e buon inizio settimana ! beautiful. reminds me of the whomping willow tree from harry potter. what a marvelous capture. ciao Pietro, buon inizio settimana. ps: mi sono regalata un obbiettivo Nikon 50mm f 1,8 con attacco compatibile all'analogica ed alla reflex, un gioiellino, appena mi riprendo dall'attacco di mal di schiena lo proverò su tutte due le fotocamere. What a perfect title; beautiful takes! this is beautiful and intriguing. Love these Pietro and the title! Ciao Pietro, buon martedi,oggi è incerto il tempo (tra neve e pioggia:-) ci ha sfiancati!! wow! we actually encountered trees like that in one of the islands here. but this one is quite large making it very beautiful even without the leaves. Is it coz it's Winter? The tree looks really impressive and with its bare branches somehow mysterious. Fantastic photos you have taken of it. A beautiful bare tree looks like painting. What a fantastic tree, Pietro! Just amazing pictures! I like the quote of Pierre Boulez too. Thanks for our conversation. Got a few thoughts to share now. Best wishes from rainy chilly town. I do want to go to Italy. That will be on my next list of places to go. This is a very curious tree indeed and you certainly captured all it's mysterious ways, specially on the first photo. wow, that's brilliant how you've framed the tree branches and created an enigmatic look! bravo! The gnarled branches are an interesting subject and «Louis» really likes the Pierre Boulez quote. Thanks for visiting Norwich Daily Photo and leaving your comment. Come visit again.